Download a free lesson sampler with important background information about the lesson sets, as well as an annotated version of lessons from Grades K, 1, and 2. 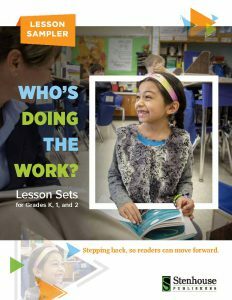 The sampler will walk you through a full cycle of lessons from Reading Art to Read Aloud, Shared Reading, Guided Reading, and Independent Reading. Complete this form to download your free sampler, and complete the shipping part of the form if you would also like a printed copy mailed to you. OPTIONAL: If you would like a printed sampler to be mailed to you in addition to the digital sampler, please provide your shipping info below. (U.S. only.) If you just want a digital version, skip this and click the Submit button.